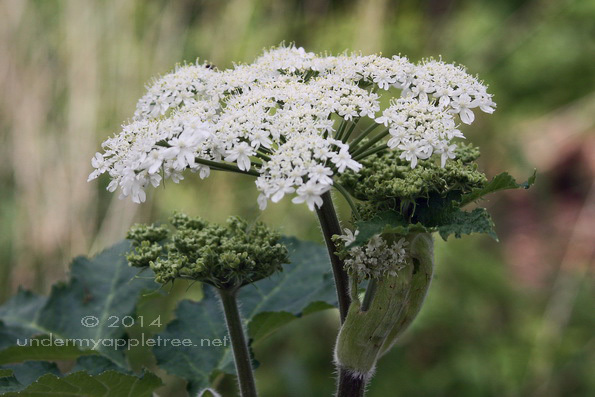 Almost wordless: Cow Parsnip is a biennial and a member of the carrot family. It’s a plant to avoid contact with – they can cause a rash similar to poison ivy. I found these plants in the wet woodland area in the nature park. They are about 4 feet tall already and will grow to a height of 8 or 9 feet. Lovely! I always have to look twice to distinguish them from Queen Anne’s Lace. Very pretty. I’d never heard of them before. I noticed them popping up last year in the restored wetlands along the nature trail. They resembled Queen Anne’s Lace, but were huge. When I saw them again last week, I looked them up and found out they are Apiaceae, the same family as parsley and carrot. You find the most amazing things! Have you considered making a photo book? No photo book yet but I am thinking maybe a nature calendar of unusual plants and critters. 8 or 9 feet? That would be enough to keep me away! Yes! When I went on my walk yesterday they were already 6 feet tall. 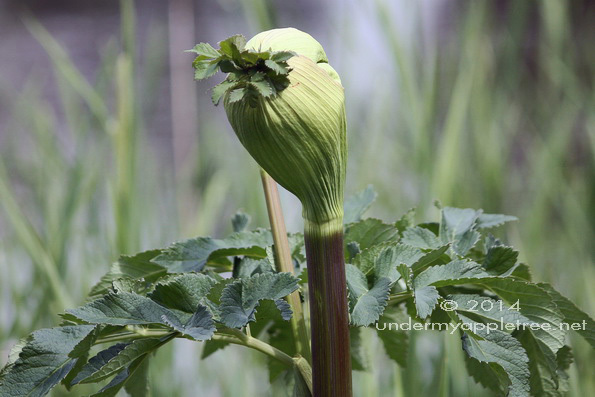 They look almost prehistoric with those huge pods for flower buds. And I stay far away from them.